This is one of those fail safe, easy to put together, dinners that I always am able to make in a moments notice. 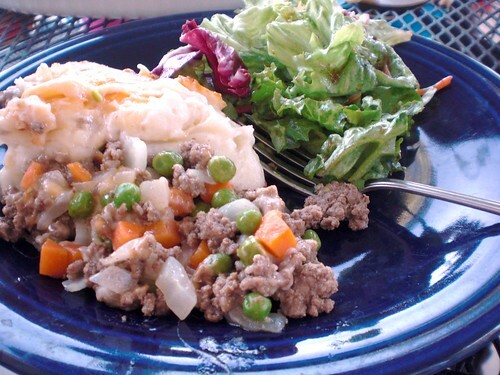 My family loves it and it is a classic casserole. Brown ground beef and diced onions in a large skillet. Once meat is brown add carrots and peas until warm. Pour beef and veggies into the bottom of a 3 quart casserole dish. (If your meat has any fat in it drain before putting in dish.) Top with 2 cups of the cheese. Top with 5 cups of prepared mashed potatoes. I use the Honest Earth All Natural Creamy Mashed ones because if you want quick potatoes that taste good these are your best bet. That and the fact that they carry them at Costco. They are also gluten free with no preservatives. Pretty tasty for instant potato. Top potato with remaining 1 cup shredded cheese and pop in the oven at 350 for 20 minutes. Bake an additional 2 minutes on broil to crisp up the cheese on top. Serve with a salad. *Note: Instead of peas and carrots you can add frozen corn. My husband has a corn allergy so we don’t include corn.